PHOTO: Allen Ramsey, DWCPhoto.com. Highlands junior Hannah Buecker boots the ball forward in a recent game in the Bluegrass Games at Lexington Christian. Buecker will see action at defender this season. The lone team left standing on top of the girls soccer scene in the Commonwealth of Kentucky is like many champions. That team puts together a solid run at the right time and weathers storms on its way to the top of the mountain. That team last year turned out to be the 12th Region champion West Jessamine Lady Colts. 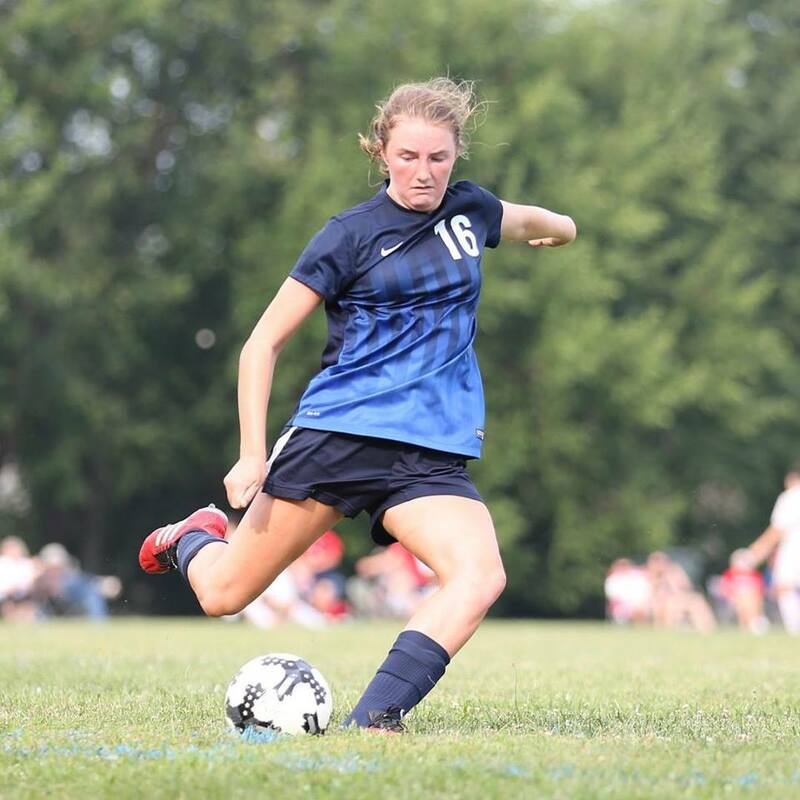 West Jessamine (24-4 overall) strung together 19 straight wins on its way to its first-ever state championship in girls soccer including a 1-0 win over defending state champion Sacred Heart in the state quarterfinals. The Highlands Ladybirds had a good reason to look at that and wonder what might have been. The Ladybirds ventured down to Nicholasville on Sept. 3 and handled the Lady Colts, 6-0 in one of 18 shut-outs on the season. Highlands strung together a solid 20-3-1 campaign earning that many wins in a season for the first time since going 21-1-3 during its second of consecutive state championships during the 2006 season. The Ladybirds won the 36th District and made it back to the 9th Region championship for the first time since 2013. Highlands also knocked off eventual region champions Sacred Heart and Owensboro Catholic during the regular season. "This team reminds me of when I think of NBA basketball. They give these guys the summer off. What do they do? They get in summer leagues and play all year because they love the game so much," said Brian Wiefering, Highlands fourth-year head coach. "Now I've never seen that with soccer before. This year, I had the most brutal week of try-outs I've ever had. Then they went down to Bluegrass Games and played their hearts out. I gave them (a Monday) off for their bodies to heal. When I came up (that Monday) night, over half our team was up here playing. We've taught them so much skill they do things on their own. It's a fun game for them. They want us to be hard. If we're not striving for perfection, then I know they're looking at us like you're not doing your job. I hate to say it's easier. But for us as coaches, these girls are making it a lot easier." But Highlands once again could not find a way to defeat the arch-rival Notre Dame Pandas in the 9th Region title game at Tower Park. Notre Dame took advantage of a bad Highlands pass and scored on an odd-man rush in the first half then held on for a 1-0 victory. The Pandas have eliminated the Ladybirds from the 9th Region Tournament the last four seasons. Highlands has beaten Notre Dame the last two years during the regular season. Highlands did appear to tie the game in the second half, but the Ladybirds were called for being offsides. During that game, Wiefering said some of the younger players got rattled by some of the things the Notre Dame players said. He recently had a player express concerns about something a parent said. He told her to read a book about preparing for that situation. In that book, a college coach has his junior varsity players sit in the bleachers and say nasty things to the varsity players to prepare them for hostile environments. "They are young. That is our fault," Wiefering said. "We should never put a game into a ref's hands whether that was a bad call or not. Good teams actually practice playing in that atmosphere. You can not let that rattle your game. If you let that rattle your game, that's your fault. If someone says something offensive in the stands, you have to block that out. Ignore it. That's part of the game. They remember that. Hopefully, they'll learn from that." The main thing Highlands has focused on in the off-season is filling in the roles last year's seven seniors provided. Forward/midfielder Sydney Ossege took her talents to Youngstown State after scoring nine goals and nine assists. Kiersten Clukey controlled the midfield well for years and is playing at Campbellsville University. Claudia Hils also played a significant role at midfield with Annalee Brewer and Karolyn Lukjan playing well at defender. Shannon Eaton played some at goalkeeper when not sick and Kayla Nehus had one touch pass late in the season after not being able to play because of an injury. Ali Gessner, Hannah Hartman and Gwen Culyer also decided not to return this year. Gessner led Highlands with 37 points last year scoring 14 goals and nine assists. Gessner is instead playing for the Cincinnati Development Academy. Players can't play high school soccer if playing for the Development Academy. Highlands outscored the competition, 89-9 last year. That starts with solid defense in the back. Highlands plans to run mixed formations this year. Senior Sophie Steppe, juniors Hannah Gish, Gwen Gorman, Hannah Buecker along with sophomores Parker Price and Maria Broering hope to provide solid minutes there. Broering could also see action at forward. "I've had to spend less time going over different formations," Wiefering said. "We could add a different formation this year that we'll use when we need it. I did spend a lot less time because the girls get it. We make sure the JV is there every year to listen to what we teach the varsity so that when they become varsity, it's already bred into them." Senior Olivia McQueary returns with three years varsity experience at goalkeeper. The back-up goalkeeper will be sophomore Maggie Hinegardner. "We're trying to get more attacking from our defense," Price said. "So as we go up, our covering is getting better. We're way better with the ball at our feet on defense. I think we'll be better than last year with the people that we have and I think our knowledge is better." Wiefering is big on winning 50/50 balls at the midfield. Highlands did that well last year. Seniors Kylie Stava, Molly Wiefering, Kaitlyn Meyer and sophomores Lauren Deckert, Kelsey Mathis, Tatum Price and Abby Stine hope to continue the solid play there. Stava could also see action at forward. Highlands has a number of scorers coming back led by junior Lindsey Meyer. Meyer had 30 points on 12 goals and six assists. Sophomore Maria Wiefering also returns after scoring eight goals and five assists for 21 points. Freshmen Kenzie Nehus, Emma Stein and Maggie Stieby could also contribute up front. Highlands recently played in the Bluegrass Games at Lexington Christian and won all three games over defending 1st Region champion Murray, defending 2nd Region champion Henderson County and McCracken County by a combined score of 10-1. Coach Wiefering said the team possessed the ball better than any game last year. The most consistent teams in Kentucky do that. "I think that this is the most confident team I've ever seen," Coach Wiefering said. "But at the same time, I don't think they realize how good they are. They're so skilled. They do things with the ball that most kids take for granted. I just had fun sitting there and watching it." Coach Wiefering went over a physical condition after a recent practice. He's hoping to make sure the players take care of themselves in what's been hot weather lately. "One thing at the end of practice (Coach Wiefering) just tried to nail it home is stretching," Stava said. "That's to stretch constantly throughout the day, not just during soccer (activities), especially when we are doing two-a-days a lot during the summer. It's a lot on the bodies. He's a great coach. He doesn't just tell us to stretch. He goes over why stretching is important, why water is so important." Highlands opens the season against Dixie Heights on Monday, Aug. 14. Game time is 8 p.m.